The Maltese authorities have made “very limited improvements” after rule of law shortcomings were flagged by the European Commission, its vice-president, Jyrki Katainen, said. 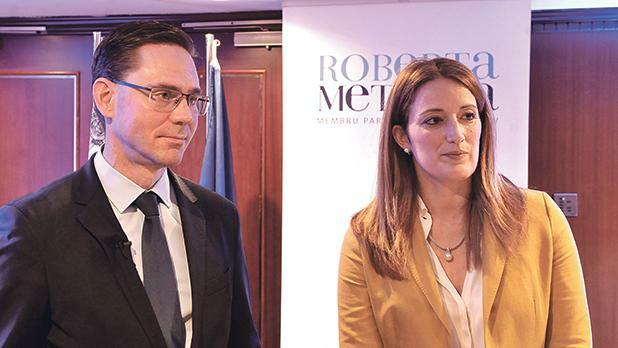 In comments to the Times of Malta on the fringes of a conference organised by Nationalist MEP Roberta Metsola, Mr Katainen, who is also European Commissioner for Jobs, Growth, Investment and Competitiveness, said that an analysis of last year’s country-specific recommendations showed that not much had changed despite the Commission’s advice. “Unfortunately, I have to say that there was very limited improvement, so we keep encouraging [the Maltese authorities]. We are ready to engage in open discussion on what to do because it is so important for this country, for its citizens and for the rest of Europe,” he said. Mr Katainen has, in recent years, spoken openly about the importance of safeguarding the rule of law in all member states, insisting last year there could be “no compromise” on this and that the issue was even more worrisome than Brexit. Asked about his views on the Maltese situation in light of criticism by Brussels that the rule of law could be in jeopardy, he pointed out that the Commission has been encouraging the Maltese authorities to update the judicial system, ensure that the judiciary was completely independent and that it could function properly. He added that Malta had been urged to “accelerate the work on addressing money-laundering and corruption”. “We want to help the Maltese authorities to address these issues because Malta is part of the EU and every single one of the member states is responsible for the other citizens in Europe as well as other member states. “What happens here has consequences on the rest of Europe,” Mr Katainen remarked. He noted that while economic growth was “always good”, it was crucial to ensure this occurred in a sustainable way. “Thus, for instance, the fast-growing financial sector in Malta is good news for those who need financing for investment but, at the same time, the Commission encourages the Maltese authorities to take care of banking supervisory activities. We have, therefore, encouraged the authorities to pay attention to the regulatory and supervisory capacity in the banking sector,” he said. He added that a fast-growing gaming sector could also be a source of concern, quickly pointing out that “nobody wants to demonise the sector” and insisting that this had to be monitored closely “to avoid unfortunate consequences if something bad happens”. Dr Metsola told the conference that a “one-size-fits-all approach to EU funding and taxation issues did not and could not always work, especially when taking the country’s insularity and economies of scale into consideration”. Addressing business leaders, stakeholders and industry representatives during the event, Dr Metsola yesterday insisted on the need for an EU regulatory environment for Maltese businesses to grow.